With its rich biodiversity and diverse ethnic minority population, Yunnan is a tantalising melting pot of exotic ingredients, vibrant flavours, and ethnic flair. 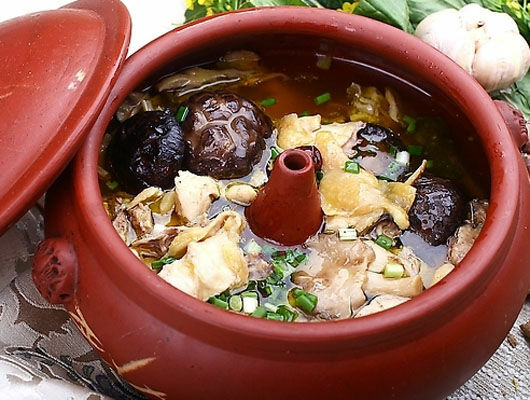 Yunnan cuisine is sometimes referred to as Dian cuisine and is known for its moderately spicy and sour dishes that boast an unexpected sweetness. Each signature dish attempts to preserve the original taste of each ingredient used and this is what makes Yunnan’s style so unique. Mushrooms and mints feature as a prominent ingredient in many dishes, but other unusual ingredients include flowers, ferns, algae and even insects. Just don’t try to worm your way out of eating these peculiar treats, or you’ll regret it! In the south of Yunnan, the signature dishes have also been heavily influenced by Burmese, Lao and Thai style cuisine, meaning that ingredients such as lime juice, coconut, and palm sugar feature widely. With that in mind, here are just a few examples of what makes Yunnan cuisine so utterly irresistible. This dish is particularly striking, as it’s made using an invention that originated from Yunnan. This cooking tool, known as a steam pot, is made of clay and the bottom of the pot has a funnel-shaped opening that goes up through the pot. When it is placed over boiling water, steam travels up the funnel into the pot and, if the pot is covered over, the steam will be trapped inside. Thus it’s an ideal tool for steaming food whilst also sealing in much of the flavour. Steam Pot Chicken dates all the way back to the Qing Dynasty (1644-1912) and was formally discovered by Emperor Qianlong while he was taking a tour of Yunnan. He tasted this time-honoured dish and admired it greatly. The dish itself is relatively simple and chicken is the meat of choice because it steam cooks easily. Chicken is added to the pot, along with rare medicinal herbs that are native to Yunnan. The chicken is then steamed for between three to four hours, until the meat is mouth-wateringly tender and the soup gives off an irresistible aroma. The herbs used vary from restaurant to restaurant, so each dish will be a little different wherever you go! The unusual name of this dish comes from an old Yunnan legend. The most popular version of the story is about a Qing scholar who would retire to an island in the centre of a lake every evening to study for the imperial examinations. His loving wife used to cook him dinner every day, but as she crossed the bridge to the island the noodle soup would go cold. She then hit upon the idea of using fatty chicken to make the broth so that the layer of hot oil covering the soup would keep the heat in. In this way, she was able to deliver a delicious hot meal to her husband each day. Nowadays, this noodle dish is hugely popular throughout Yunnan and many locals have it regularly for breakfast. 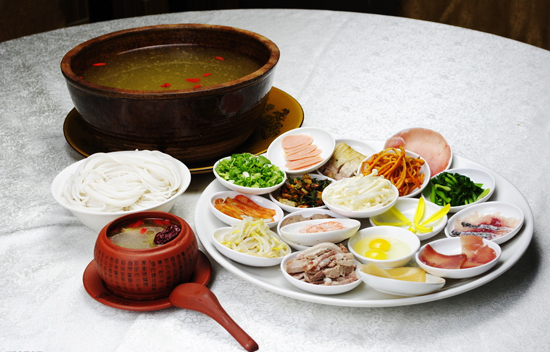 In some restaurants, the broth is served separately from the raw ingredients and you cook the dish at your table like a hotpot, while in other restaurants it will all be served together. First the broth is made by boiling a fatty chicken with pig bones. Then meat, such as chicken, pork, liver, fish, or ham, is added to the broth along with an assortment of boiled vegetables. Finally the rice noodles are added and the dish is seasoned with chilli oil, ground peppers, sesame seed oil, and salt to taste. Each vendor will have their own variation on this tempting treat, so be sure to try a few and find the one you love! The name “old granny’s potato” comes from a long running joke in Yunnan that this dish is so soft even an elderly person with no teeth could eat it easily! But don’t worry; you won’t have to go all the way to an old folks’ home to find this home-cooked delight. This potato dish can be found in most restaurants throughout Yunnan and is the ideal comfort food, similar to mashed potatoes or bubble and squeak. 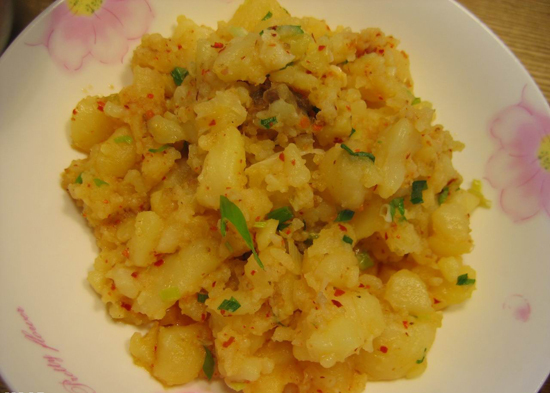 Cooked potato is first mashed and then stir fried with a selection of seasonings, including garlic, spring onion, dried chillies, and ground Sichuan pepper. Fresh or pickled vegetables, such as pickled mustard, pickled cabbage, fresh carrot, and sweet peppers, are sometimes added depending on preference. The meat-eaters among you can also add Xuanwei ham to the dish, which gives it an extra salty, smoky tang. This dish can be easily adapted to suit anyone’s palate and is so comforting to eat that it feels like a warm hug from a loving granny. 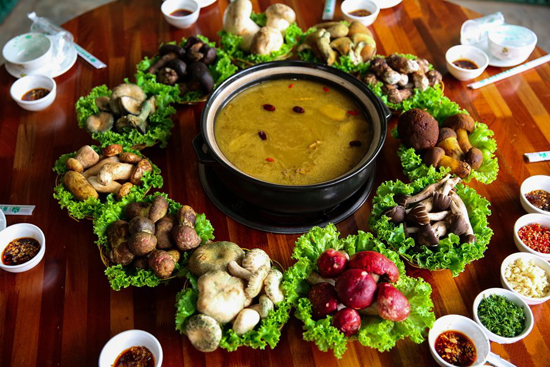 Every year, from June to September, visitors to Yunnan are greeted with a plethora of delicious, edible mushrooms, for this is the annual mushroom season! Each one is named based on its appearance or taste, ranging from the monkey head mushroom and the cow liver mushroom to the rare and highly prized matsutake or pine mushroom and the fish-flavoured seafood mushroom. These funky fungi are a banquet in of themselves and each boast unique flavours and medicinal qualities. Along Guanxing Road in Kunming there is even a mushroom hotpot street, where small restaurants crop up during mushroom season and serve only their variation on this delicious dish. As with all hotpots, you’ll first be presented with a large pot containing broth. The broth is boiled at the table and will contain a mixture of seasonings based on that restaurant’s secret recipe. You can then add a selection of raw ingredients, including day lily bulbs, vermicelli, leeks and Chinese lettuce. You will then choose a selection of tasty mushrooms and your waitress will tell you in what order they should be placed in the broth. This is to make sure they are all thoroughly cooked and ready to eat. Some of these wild mushrooms are mildly toxic until they are cooked through, so we strongly recommend following your waitress’ advice carefully. Trying something new makes for a fun risk, but eating a toxic mushroom is not a risk you want to take!